Perovskite crystal structure. 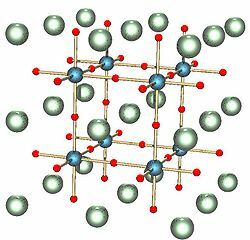 Perovskites are crystals with structure ABX3 where A and B are cations of different sizes and X is a halide atom. The green and blue atoms are the cations and the red is the halide. Current solar cell technology uses a perovskite crystalline form containing lead, methylammonium (CH3HN3), and a halogen as the light-absorbing material. Organo-lead halide crystals are responsible for the recent increase in solar cell efficiency gains. Today’s cells work around the 35% efficiency point. The only problem is all the lead found in the cells. Lead is toxic in our environment. Over the years, we’ve tried hard to lessen our exposure by removing it from our products. Solar cells should not be an exception. Scientists at Northwestern University have discovered a way to get the lead out of solar cells. They have demonstrated they can replace the lead with tin in the perovskite crystals. Tin is in the same element group as lead, so it is expected to have some of the same chemical properties. The Northwestern University group’s tin-based crystals showed an efficiency around 6%, but they believe their technique could be refined to match, or even exceed the 35% mark of lead-based crystals. Perhaps these findings will give another boost to the solar energy industry and lead to plentiful renewable power. More information about these crystals and their production was published online on May 4, 2014 in Nature Photonics. ← What Does STP Stand For?